A little while ago I reported to you that I'd posted thousands of Victorian and early 20th century photographs at the Chapman, where I was working. And they are lovely sources, especially since I gradually added more and more portraits, plus a batch of pattern envelopes from the 1900s and 1910s. Just try out the random image page! But here is something even more exciting. Over the past couple of weeks, after doing all of the important photographs and some significant objects, like Civil War amputation kits, I convinced my supervisors that dresses would be a great addition to the website. There are some wedding dresses with good provenance, and others that have an owner attached but no event, and others with no provenance but I thought were great examples. But there really wasn't a good place to dress a mannequin and take a picture. 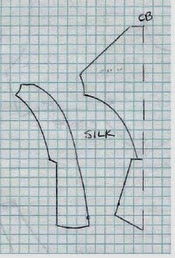 So I devised a solution: I'd take a picture of just the bodice, lying flat, and then draw up a pattern, which would give much of the information that a fully-dressed mannequin would, without the hassle of wondering, for example, "am I just reading the shape of the skirt panels that way because of the hoop they dressed it over?" And with the added bonus that the links will likely get shared far and wide, farther and wider than word would have spread for just the photos, which is good for the museum. To which end, by the way, I would really appreciate it if any pinning were to be done from the museum's site rather than Scribd, where I uploaded the PDFs of the patterns with descriptions/instruction - thank you in advance! Now, you can see them all if you search from the main page for "dress", "ensemble", "drawers", or "slipper" among only the objects, but I'm also going to do entries here for each one, just sort of ... rambling on about the garment - how I dated it, something that was tricky, the provenance, that sort of thing. Cabinet des Modes is almost finished; I've started translating a very short publication on the dress of different levels of pre-Revolutionary French society, and I'll be posting that every Monday and Friday, and then these on Wednesdays. You may have noticed that I said "was working". Today was my last day (as I calculated Wednesday evening), and now I am back to applying for jobs. However, this episode has made me very confident about what I can do for other small museums, and I'm planning to offer my services around, as well as my typing fingers to apply for grants to fund said services. The best I can do is link to the main search page. I wish there were a single page with all of the patterns on it, but there's no one term used for all of them. Ooh, that's something to think of for the future - probably all patterned garments should have "pattern" in the Search Terms or Classifications. Yeah, tee hee, its all about the filing, alas! Tanks again, though. This is really helpful! What a fabulous source! Thank you so much for posting about it; I'm looking forward to reading your individual entries. Thank you! I hope the patterns prove useful. It was a very busy few weeks! And now, of course, much more peaceful. Although I am getting into another patterning project with a friend which might have some interesting results - and I'm being considered with Anova (now Pavilion) right now, which might involve me taking some more patterns for the book. A thousand times THANK YOU for this amazing work : you're the new Janet Arnold ! Well, that is my life's ambition!